White House deputy press secretary Raj Shah speaks during the daily press briefing in the Brady press briefing room at the White House, in Washington, Feb. 8, 2018. The White House confirmed late Friday that a second staff member had resigned over allegations of domestic abuse. Spokesman Raj Shah said David Sorenson, a speechwriter for the Council on Environmental Quality, resigned Friday. Two days earlier White House Staff Secretary Rob Porter stepped down amid accusations by both his former wives that he had abused them. Sorensen denied the abuse allegations, which were first reported Friday by The Washington Post. Sorenson’s ex-wife had told the Post that he was violent and emotionally abusive during their short marriage. White House Staff Secretary Rob Porter arrives with U.S. President Donald Trump and first lady Melania Trump aboard Air Force One at Joint Base Andrews, Maryland, U.S. Feb. 5, 2018. President Donald Trump said Friday that he is very sad at Porter’s resignation. The president did not mention the former wives or their claims that Porter physically and psychologically abused them. The revelations about Porter have raised fresh questions about the attitude of senior White House staff toward allegations of improper behavior by employees. It has also cast a spotlight on the practice of allowing staff without security clearances to work in and around the Oval Office. Porter had only an interim clearance while holding one of the most sensitive jobs in the White House, where he controlled the flow of information to the president. A full clearance had been held up while the FBI investigated abuse allegations by his two former wives. Porter’s swift resignation followed publication in Britain’s Daily Mail of a picture of his first wife, Colbie Holderness, with a black eye allegedly suffered when Porter punched her in 2005 while the couple was on vacation in Italy. Holderness and Porter’s second wife, Jennifer Willoughby, were both quoted by the tabloid as saying Porter’s consistent abuse was the reason for their respective divorces. 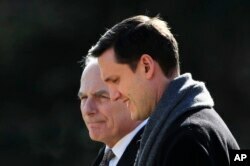 White House staff secretary Rob Porter (R) walks with White House Chief of Staff John Kelly to board the Marine One on the South Lawn as they leave the White House in Washington, Feb. 2, 2018. The Porter matter has intensified scrutiny of White House Chief of Staff John Kelly, a former army general brought in to bring order to an administration that had been seen as chaotic under previous chief, Reince Priebus. Media reports say Kelly apparently had prior knowledge of Porter’s inappropriate behavior. Critics say Kelly should have been more concerned about employees working without security clearances. A day after Kelly and Press Secretary Sarah Sanders spoke warmly of Porter, his departure was announced with a terse comment. “He was terminated yesterday and his last day was yesterday,” Shah, the deputy press secretary said Thursday. Shah characterized the departure as a resignation, however, rather than a firing. Porter, a Rhodes scholar and Harvard-educated lawyer, played an important role in deciding which articles and policy proposals were given to the president for his review. Porter had a hand in writing Trump’s recent State of the Union address, and news photos and videos often showed images of him with other members of the White House inner circle. Several news agencies have reported that he is currently romantically linked with another close Trump aide, White House Communications Director Hope Hicks. Porter issued a statement Wednesday denying the accusations.